With the present birthrate, the Nordic stock will have become a hopeless minority within fifty years, and will within two hundred have been choked to death, like grain among weeds. Unless some means is found of making the Nordic feel safe in having children we are already doomed. When Evans, the Ku Klux Klan’s Imperial Wizard and Emperor, offered this non-scientific demographic projection in the pages of the respectable North American Review in 1926 he wasn’t far out of the mainstream. Two years earlier, the U.S. Congress had passed an immigration restriction bill that severely narrowed the gates through which immigrants from eastern and southern Europe passed. The impending, relative decline of the Nordics was a leading justification for the measure. Evans’ apoplexy contrasts with the relative equanimity that greeted the recent news that non-white births now outnumber white births in the U.S.—presaging a non-white majority by midcentury. * While the initial frenzy of reporting dripped with anticipated angst, the nation largely managed to keep its composure. Interestingly, much of Evans’ vitriol—and much of the contemporary KKK’s general vitriol—was aimed at the Roman Catholic church. 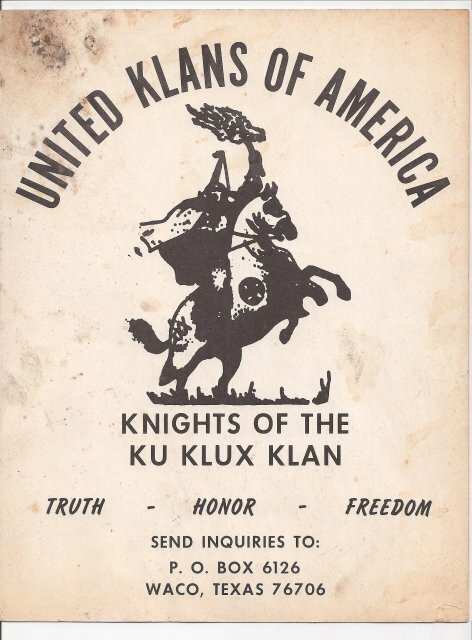 Anti-Catholicism didn’t come to an immediate end when the Klan imploded in the late 1920s. But it never again reached such heights. While religion and ethnicity are very different social categories, and early 21st domestic and international politics much different than those of pre-Great Society, Cold War America, we can still discern some revealing parallels between the conditions under which white Catholics were successfully integrated into American society and those now surrounding the growing Hispanic population. In other words, we have a historical precedent for the accommodation of a large block of new immigrants in the U.S., despite the hyperbolic fury of the extreme right and the dour pessimism of the extreme left. 5.Explicit prejudice against Hispanics is increasingly confined to the extreme, economically marginal right—just as it was for early-mid-20th-century Catholics. This ad-hoc collection of rough analogies doesn’t guarantee anything about the next few decades of course. The investment firm’s stipulation that past performance is no guarantee of future results also goes for social change. And we should worry about the effects that the return of pre-World War II-levels of economic inequality might have. Still, the case of early 20th century Catholics is instructive and encouraging. * There are problems with the accounting, mainly because those Hispanics who identify as whites were included in the “non-white number.” On this see Jeff Jacoby’s piece in The Boston Globe and Matthew Yglesias’s piece in SLATE. History is repeating itself in other ways in recent days. The new Florida election laws may be a violation of the 14th amendment. This is a really interesting post, Chris! I rarely remember to factor in the whole Catholic angle when I think about the Klan in the 20s and the race suicide arguments of that era, and you are quite right to emphasize it. Thanks for this. Anyone have any suggestions for new books on the 20s Klan? I still like Leonard Moore's book from the 1990s (?) but surely there have been newer ones. Thanks Heather and Randall. Heather, I need myself to read Kelly Baker's _Gospel According to the Klan_. It an Pegram's _One Hundred Percent American_ were reviewed here http://www.nytimes.com/2011/11/27/books/review/the-not-so-invisible-empire.html?pagewanted=all last November.